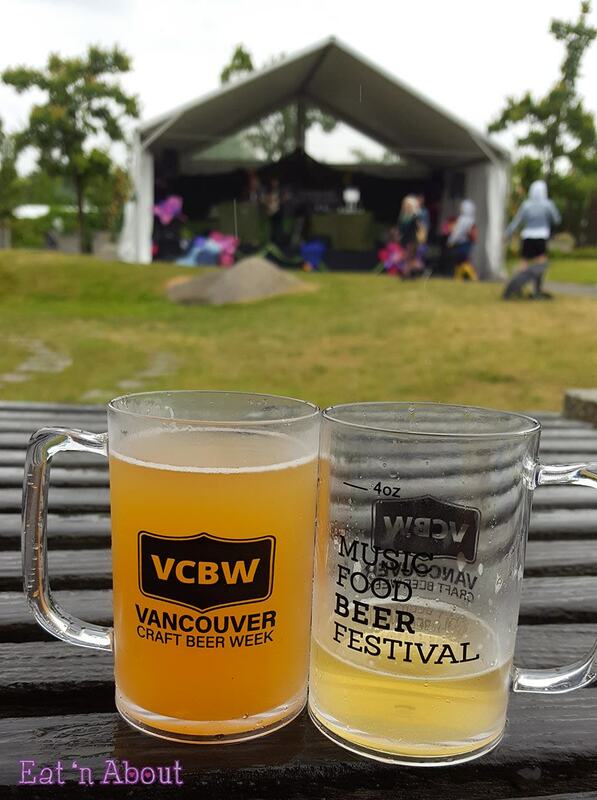 This past weekend was Vancouver Craft Beer Week‘s annual festival at the PNE. AngryRussian and I had the opportunity to go and it was a joy as always to go and see both old and new local craft breweries do their thing! What I absolutely enjoy about these types of events is that you get to sample a bunch of different, unique beers from a ton of craft breweries! 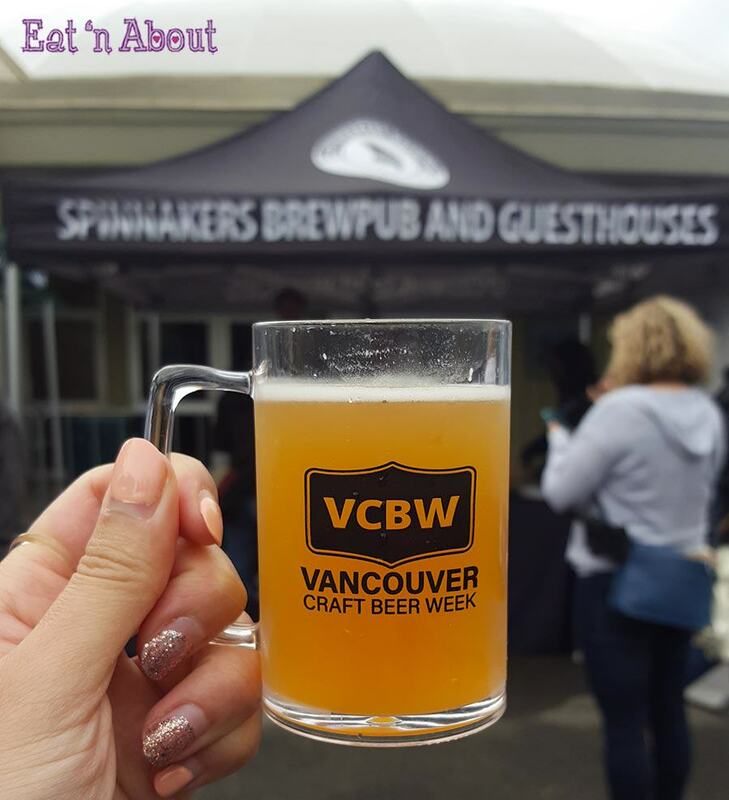 They are mostly local to BC but there is also an area of American craft breweries as well! 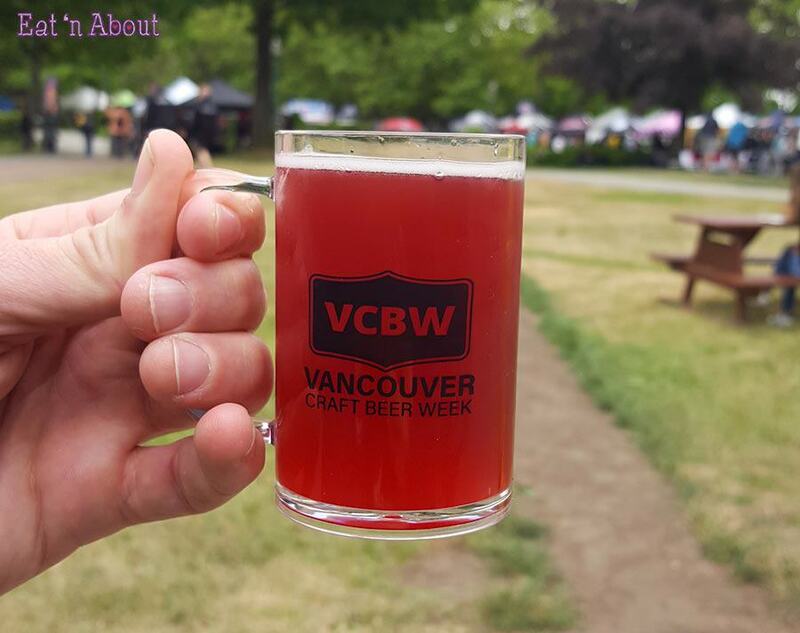 I noticed that the trend this year seems to be raspberries as a lot of the breweries had some sort of raspberry-flavored item. As was blackberry. 4 Mile Brewing has a great Blackberry Ale for example…it was hearty and true to blackberry flavor. 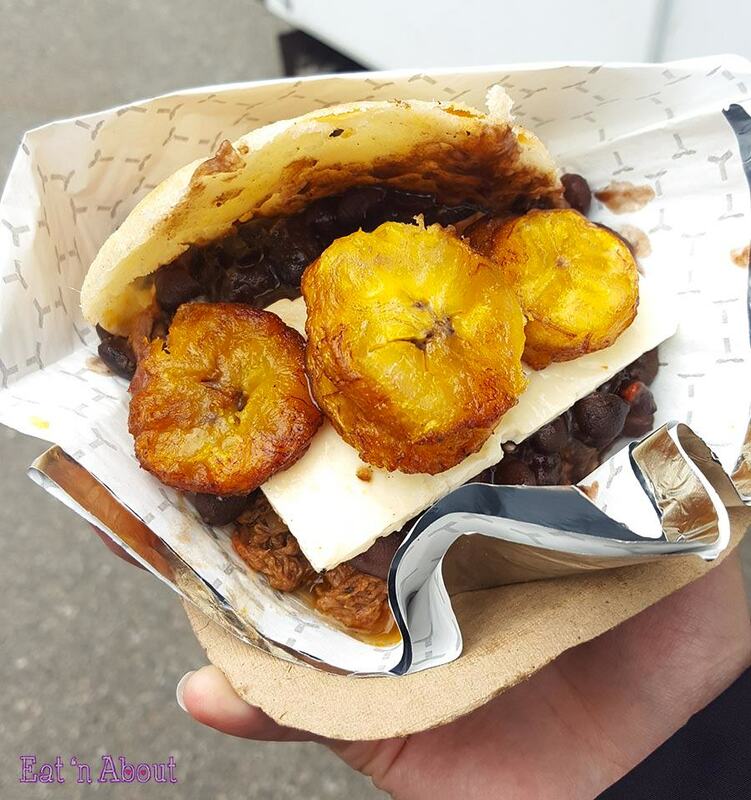 Come Arepa was one of the food options available and we shared the Pabellon ($11). It’s described as ‘A Venezuelan specialty. Shredded beef + black beans + sweet fried plantains + grilled white cheese’. It was very messy to eat and we couldn’t imagine holding it in our hands, so we tore at it with forks and took little bits of everything in a mouthful. The beef was very yummy and moist. The sweet plantains were a little odd to add to the savory flavor profile but it was good. The grilled cheese still held its shape in that it wasn’t melty. The corn arepa was moist also. Overall a yummy start. Continuing on with the beers, next we visited Vancouver Island Brewing and tried their Ukidama Lychee Saison. Unfortunately we found that there was no lychee flavor…in fact it tasted a little odd. AngryRussian is all about the IPAs so at Spinnakers he picked the Juice Monkey Tropical IPA. I had a sip and it seemed to not be as bitter as regular IPAs. As usual it’s citrusy though which I think is why so many IPAs are called “juice” or “juicy” or “citrus” haha. 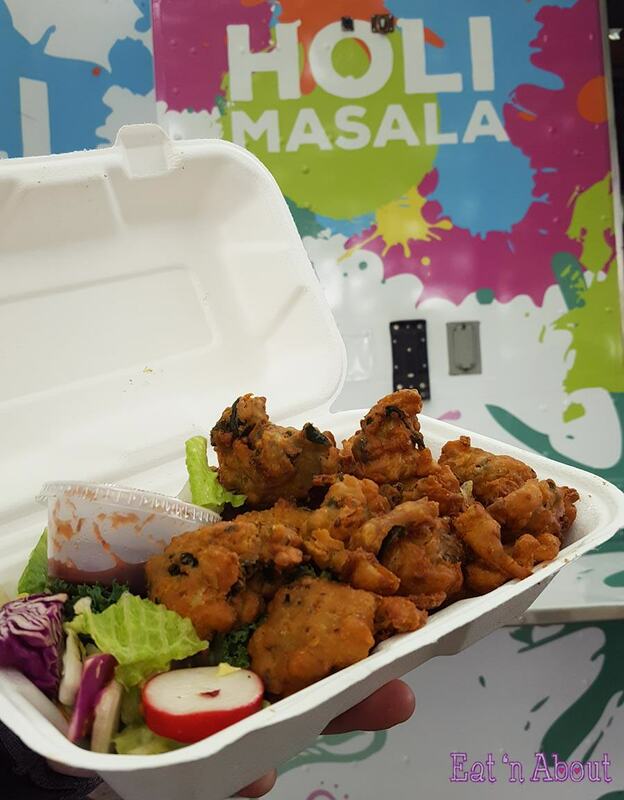 Next we got some Vegetable Pakoras ($9) from Holi Masala to enjoy at the “Secret Garden” area of the event while listening to Mark Woodyard (he’s awesome). The pakoras were crispy and fresh. There were lots of big pieces and were spicy. The veggies really helped to temper the heat. I felt like some fries after and I remember every time I see the Wings Outdoor Grill truck I always want to try their Wasabi Garlic Fries ($8) and so I finally got some this time. AngryRussian doesn’t like wasabi so I got them without wasabi. Here they are. They’re not at all like I expected/imagined. These to us are not “garlic fries”. 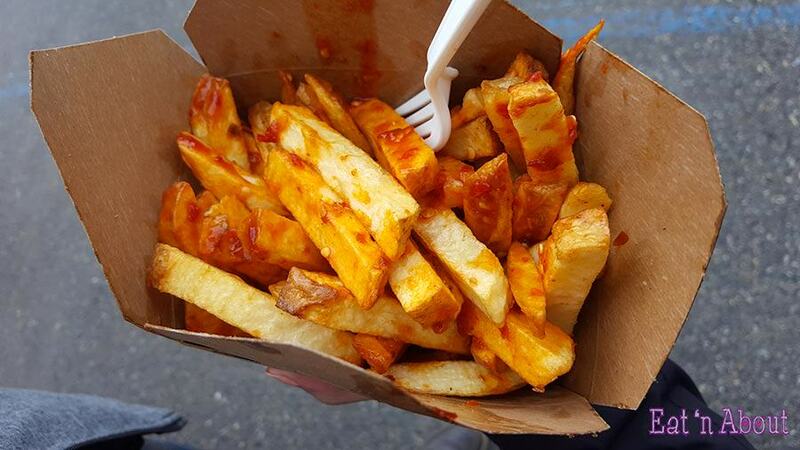 These are “Sambal Fries”. And they were NOT GOOD AT ALL. The fries are thick and not double-fried so the texture was mealy and dry. They just don’t look good, and tasted even worse. Please do yourself a favor and DON’T EVER GET THESE. I don’t think the wasabi would’ve made it any better. What a waste of $8….could’ve gotten more pakoras. 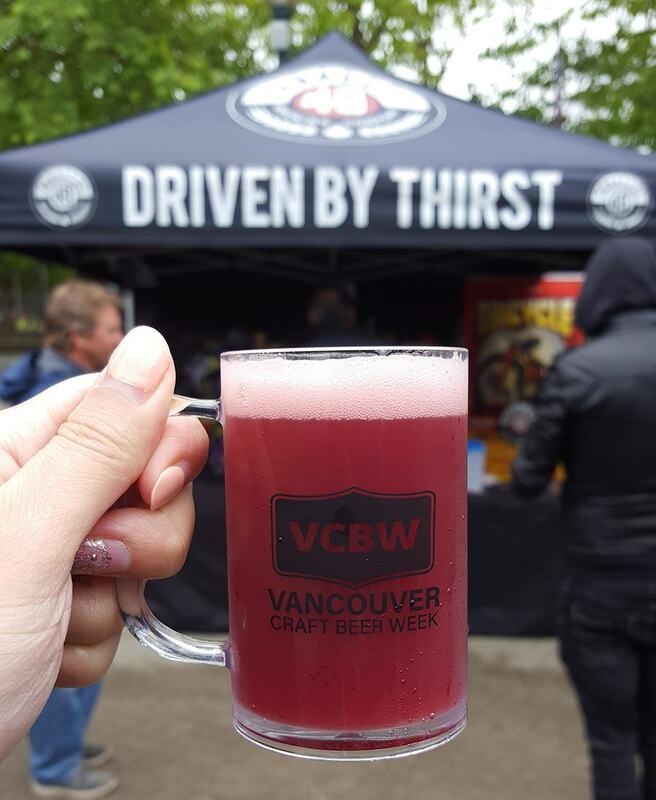 To end on a good note I got some Triple Berry Smoothie from Parallel 49 Brewing Company. It was very berry and smooth. Yum! I forgot to take a picture of it but my favorite of the whole festival was Colorado’s Left Hand Brewing‘s Peach Beerlini Radler. It was peachy and sweet and yummy…I went back for seconds! 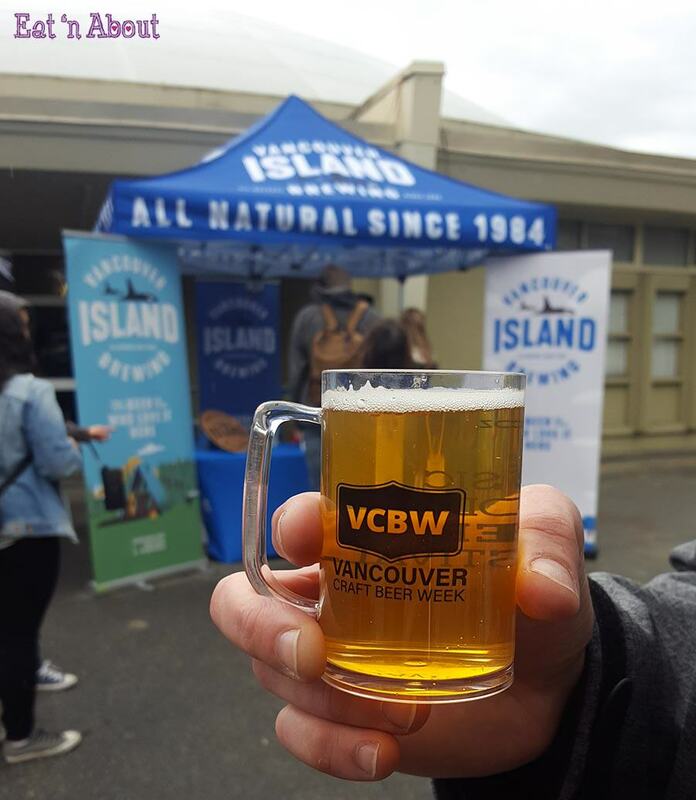 It was another great experience at the Vancouver Craft Beer Week festival! If you’ve never been make sure to get your tickets next year! It’s always the last week of May! To see my post of last year’s event click here!